Palestinian Authority recognized as 'state' during Abbas visit. But will it have practical significance? The Greek parliament recognized the Palestinian Authority as "Palestine" moments ago, during an official visit from PA chairman Mahmoud Abbas to the country. 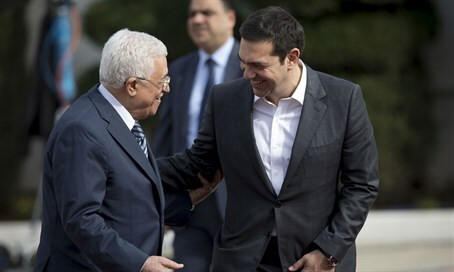 Prime Minister Alexis Tsipras stated Monday that the vote to recognize the PA as "Palestine" - if passed - would only cement the formal recognition for a later, "appropriate" date. Greece will, however, change "PA" to "Palestine" on all official documents. The Greek foreign ministry stated last month that recognition of “Palestine” will be held by the Greek Parliament and not by the Greek State, in order “not to disturb good relations with Israel" - therefore making the move symbolic, rather than practical. Deputy Foreign Minister Tzipi Hotovely (Likud) condemned the move Tuesday, noting that the effort "leads nowhere." "The Palestinians and Mahmoud Abbas continue to choose the path to unilateral recognition with no practical significance," Hotovely stated. "Instead of Abu Mazen [Abbas - ed.] halting incitement and financing of terrorism, he is running down a crooked path which will lead him nowhere." "The political collapse continues," MK Nachman Shai (Zionist Union), Deputy Speaker and member of the Knesset's Foreign Affairs Committee, added. "Greece, a declared friend of Israel, today joined the circle of countries that recognize the Palestinian state." "Israel argues with itself as the world moves forward to the recognition of a Palestinian state without negotiations, along '67 borders," he continued. "We've missed the boat." Greece joins a host of European countries to recognize the PA as a "state." Britain was the first country to vote to recognize “Palestine” last year; Sweden also announced it officially recognized the state of "Palestine." Last December, Portugal's parliament adopted a resolution calling on the government to recognize a Palestinian state, though Portugal's Foreign Minister Rui Machete said after the vote the government "will choose the moment best suited" to recognize the Palestinian state. Similar motions passed in France, Ireland, and Spain - but these moves are symbolic gestures and have little, if any, actual diplomatic effect. Elad Benari contributed to this report.